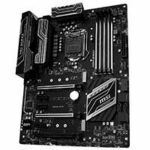 mATX vs ATX motherboard – What should you use for your gaming PC? A lot of people get hung up on what form factor they should pick when choosing a motherboard – the cheaper & smaller mATX, or the slightly more expensive & larger ATX? There are other options to choose from but these 2 are the most commonly used, let’s take a look at which is going to give you a better bang for your buck when building a new gaming PC. Before we get too far ahead of ourselves, I’m going to take a second – more like a few minutes – to explain the basics of what motherboards are and why they’re important. There’s no point in learning which size is better if you don’t know the basics! Without turning this into a history lesson, motherboards have been around for a long time but both ATX and the smaller microATX were developed in the mid-late 90s by Intel. ATX was quickly adopted as the “standard” for motherboard design and the rest is history. Fast-forward to now, there are both bigger and smaller motherboard variants like eATX (bigger) and mini-ITX (smaller), but for the purposes of this article, we’ll be focusing on just microATX and ATX motherboards as they’re the most commonly used; and the only sizes to consider for most gaming PCs. So, what is a motherboard? Basically, it’s the hub of your PC. It’s where all information is passed through and it even distributes/regulates power to some components. In new motherboards, it’s also handling your wired internet connection as well as your audio (assuming you don’t have an external DAC or something similar), and even your WiFi on more expensive boards. I could keep going with all of the things your motherboard does, but I think you get the point, it does a lot. With that in mind, it’s worth noting that not all motherboards are the same. AMD and Intel (the only 2 manufacturers of processors) both have their own proprietary sockets that they use for their different processors; because of this, motherboard manufacturers have to make different motherboards to support the different sockets. On top of the different sockets, there are also multiple chipsets for each individual socket. Meaning, there’s not just 1 type of motherboard to pick from after you’ve found the ones that support your CPU’s socket, there are often upwards of 3 different chipsets per socket making for a lot of different (or not so different) option to choose from. Talk about confusing! Now that you know what motherboards do, where the ATX and mATX standards came from, and the differences in sockets and chipsets between CPU manufacturers, I think it’s time to move on! One of the first (and easily the biggest) differences that anyone will notice between an mATX and an ATX motherboard is the size. Most micro-ATX motherboards will often have less available ports and headers than an ATX board, a good example would be how many available slots for RAM there are – most mATX motherboards will usually have 2, ATX motherboards will almost always have 4. If you’re planning to build a basic PC to upgrade as you go, an ATX motherboard might be better for you. But, if you’re building a budget gaming PC that you’re just going to use until you need to build a new one, an mATX board might help save you a few $ in the short-term. Ultimately it’s up to you, but I often suggest mATX motherboards over ATX ones unless the build costs more than $1000. The type of case you’re going to get also determines the size of motherboard you can use. Like motherboards, cases come in varying sizes; with that in mind, you have to have the right sized board for your case, or get a case big enough for your board, either or. A mid tower case that supports an ATX motherboard will fit an mATX motherboard as well, but an mATX case will not fit an ATX motherboard (in most cases), etc. You also want to consider what kind of features you’re going to need. Some might want a motherboard that’s very reliable when it comes to overclocking, others might need 5.1 or 7.1 audio ports, and some people just want a motherboard that’ll do its job without having to tinker around too much. Depending on what kind of person you are, there is definitely a motherboard that’ll be perfect for your own personalized needs. Whether that’s RGB lighting, overclocking potential, additional PCIe ports, or whatever it is that you need! Something to keep in mind is that not all mATX motherboards are for the budget-minded builder, some come with similar high-end features that you would get out of a pricier ATX board. Take the $200 ASUS ROG Maximus VIII as an example of a fully-loaded mATX mobo. Your budget is something that should be considered when picking out your motherboard. Generally speaking, if you build costs less than $1000, you probably shouldn’t be spending much more than $100-$110 on your motherboard, otherwise, you’re just wasting resources that would be better off dedicated elsewhere. Like I’ve already mentioned, you can get mATX motherboards for considerably cheaper than ATX boards most of the time and this is without a doubt my recommended route. Seeing as how a lot of mATX motherboards are coming with 4 slots for RAM these days, there’s even more reason to go that way instead of ATX in most cases. One of the biggest downsides with mATX boards was that they would only ever come with 2 slots for RAM, making RAM upgrades a pain. But, since that’s changed, mATX boards have quickly become the standard. That all said, if you’re planning on doing a lot of upgrades to your PC in terms of a multi-GPU setup and/or liquid cooling, then you will definitely want to spend a bit more on your board right away, opposed to having to upgrade your motherboard down the line. The latter would ultimately cost you much more in the long run. Because mATX and ATX motherboards are sized differently, it would be a fair to assume that there’s going to be different cases for either – and there are. If you’re concerned with saving as much space as you can, then an mATX motherboard inside of an mATX case would do that for you; some mATX cases will even accommodate big graphics cards and good aftermarket CPU coolers. 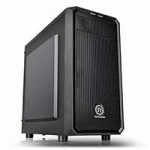 The Thermaltake H15 is an example of a great, but inexpensive mATX case option. You don’t necessarily have to use an mATX case if you’re going to use an mATX motherboard, though, most mid-tower ATX cases will have mounts for the smaller mATX mobo. There’s really no downside to using an mATX motherboard inside of an ATX case, if can save a few bucks without sacrificing the features you need by going mATX over ATX, do it! Airflow is something else you should keep in mind when picking your case, especially when you’re building a gaming PC with air cooling. You definitely don’t want to pick a case that doesn’t have good ventilation; what you do want is front fan mounts and a rear fan mount at the very least, picking a case with an opening on the top is even better. When it comes down to picking the right motherboard and ultimately choosing mATX vs ATX, it boils down to the features that you need and how much you’re willing to spend. If you want to keep your build compact by using an mATX case and an mATX motherboard, but you also want to retain a lot of the ATX features, then be prepared to spend a bit more. Once you’ve determined the size you’re going for, your next step is to determine the processor you’re going to use + the socket and chipset best suited for it. If you’re unsure of which processor to use, check out my list of the best CPUs to use for your gaming PC. By this time, you should also have a good idea of which case you’re going to be using. After you’ve determined the socket and chipset you’re looking for, it’s time to consider the features you need. Do you need 7.1 audio? Do you need on board WiFi? Do you need an extra PCIe slot for a WiFi adapter? Extra fan headers? 2 or 4 slots for RAM? RGB lighting? Multi-GPU support? These are all things you should be considering to make sure you pick the right motherboard. Not all motherboards are the same and simply buying the cheapest option isn’t the best choice in most cases, that’s why it pays to do your research and know what you need beforehand! Although there are a few other form-factors outside of micro-ATX and ATX, these are the 2 most popular sizes of motherboards that are used in gaming PC builds. 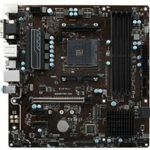 Both mATX and ATX motherboards have their individual pros and cons, mATX boards are great for saving space but often skimp on features, ATX boards have lots of features but cost a bit more. Which form-factor you eventually decide on is entirely up to your plans for your build and how much you have in your budget. 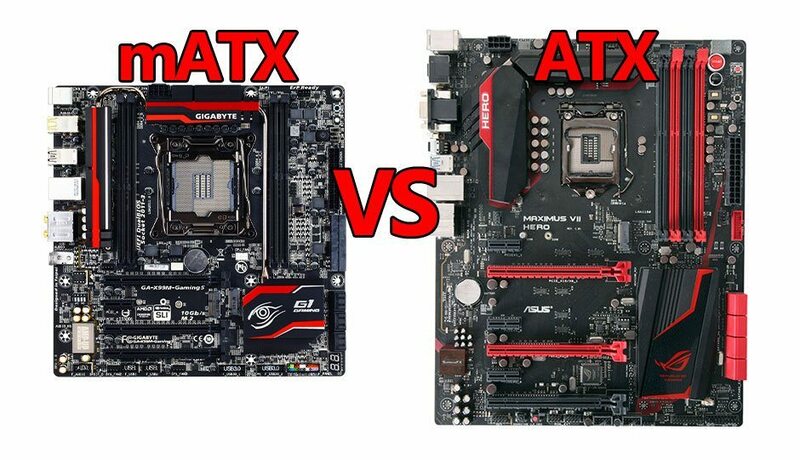 At the end of the day, both ATX and mATX motherboards serve their purposes, neither one is measurably better than the other assuming they’re offering the same features. There’s no performance difference between an mATX or ATX motherboard, no difference in overclocking capabilities (on comparable boards), and ultimately no reason to choose one over the other outside of your own personal needs! Just make sure that your motherboard supports your processor’s socket and runs on the appropriate chipset, and also make sure that your motherboard and case will be compatible together! Do you just need a cheap gaming PC that saves space and money? Do you need a mid-range build? Or do you need a high-end gaming PC? If you have any questions, comments, or anything else, feel free to leave them below! Very helpful!!! I am embarking on my first PC build, and until I read this article, I really didn’t know where to start. My eyes were glazing over when looking at build lists on pcpartpicker! But now I know: start with the motherboard! Glad to hear you’ve found this helpful! Sourcing the parts for your first build can always be a challenge, especially when you’re not 100% sure what to be looking for! With that in mind, I wouldn’t necessarily start with the motherboard. The first part to pick would be your processor, in my opinion. From there, you can choose the right motherboard to support it, and then everything else. Great article, it’s nice to have a comparison between mATX and ATX. I usually go for an ATX, I like having extra slots for everything just in case I need to upgrade in the future! I tend to agree that ATX mobos are more convenient than mATX. But, it’s sometimes hard to argue with the pricing of an mATX board, especially when it offers 4 DIMM ports and similar features to a comparable ATX board! You’re talking nonsense, how do empty slots help you upgrade? Upgrade surely means to swap a part out for a better part?… like saying “instead or living in a house I like to stay in a hotel, just in case 30 friends come over and I need the extra rooms”…. ATX is becoming more pointless, especially now CF/SLI is no longer needed as a single card is powerful enough nowadays. Get rid of wasted space, huge towers and slots you don’t need! Nothing looks more ridiculos than a huge tower with one GPU installed and masses of free space. mATX should be the new standard for PC mobos. I don’t know if you realized, but you replied to a 2-year old comment here. Also, wouldn’t adding more RAM be considered upgrading? How about adding more storage? “Upgrading” isn’t completely limited to swapping parts. 2-years ago, ATX mobos were still more convenient than mATX. Back then, it was pretty uncommon for mATX mobos to come with 4 DIMM slots for RAM – they usually only came with 2. They also didn’t come with things like M.2 ports, but ATX boards did. Another major drawback (that’s still present) is PCI slot placement and number – if you need to run a WiFi adapter or an aux sound card on an mATX board, it can potentially choke your GPU (depending on how cramped the ports are) which can easily result in it getting less air and running hotter than it otherwise would. If you need both, well, that would have been (and still is) a bad idea on an mATX board due to how cramped everything would be. So, back then, “empty slots” could have meant more than 2 DIMMs for RAM, more storage options, or better PCI placement for things like WiFi adapters or sound cards – PCI/PCIe placement is still relative today depending on your needs. Now, 2 years later, a lot has changed. Most mATX mobos come with 4 slots for RAM, M.2 slots, and pretty much everything else you’ll see on an ATX board. Definitely a great option for most people. Lastly, the size difference between an average mATX case and your typical mid-tower ATX isn’t tremendous, usually only about 2-4 inches in height and that’s it. Unless you’re talking about a cube like the Core V21, then it’ll be about 5-6 inches shorter for sure, but the width is practically double that of a mid-tower ATX or mATX case.